Have an electrician round, just cutting plasterboard for double sockets. 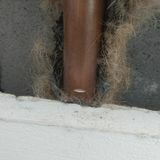 Have slightly nicked a copper pipe, any suggestions on how to repair this? no water leaking yet, I must add. nice one, thank you both.